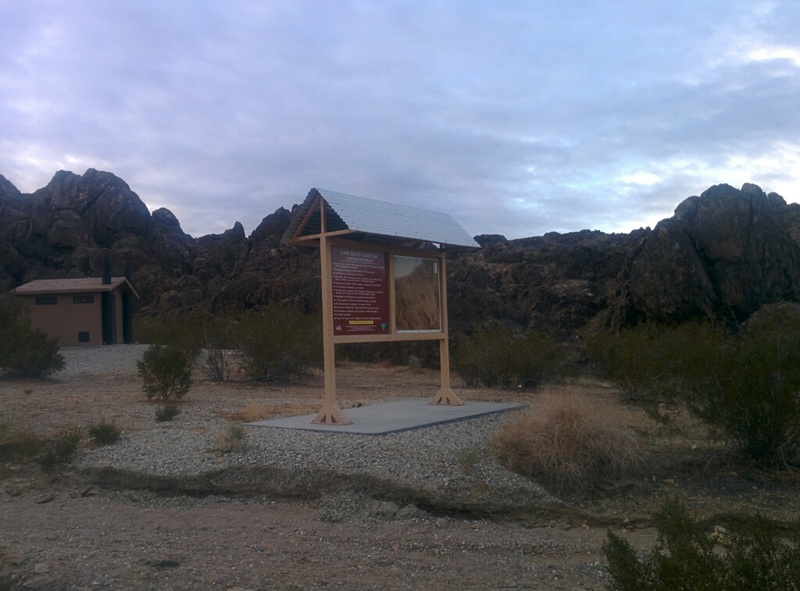 About 17 miles out of downtown Barstow, CA, on the opposite side of Barstow Rd/Hwy 247 from the New Jack City rock climbing area is the BLM’s Sawtooth Canyon campground. It is reached by a lightly washboarded well maintained dirt road. A 4×4 or high-clearance vehicle is not needed. Once we arrive at the campground there seems to be two main levels of campsites. I consider them the top and bottom. The bottom sites are what you see when you first drive in. Concrete-walled twin pit toilets near a large rocky hill surrounded by a half-dozen or so campsites. 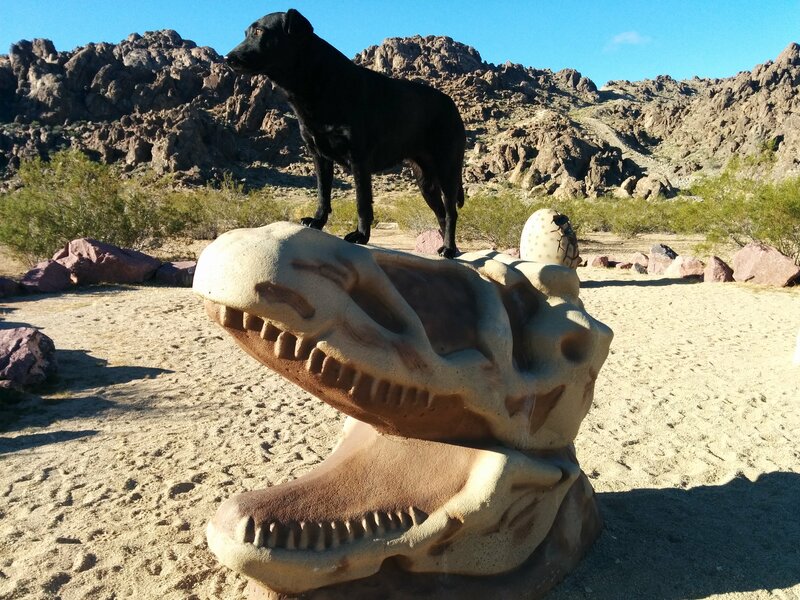 There is also a play area with concrete dinosaur bones, eggs and skulls to sit or play upon for those inclined. 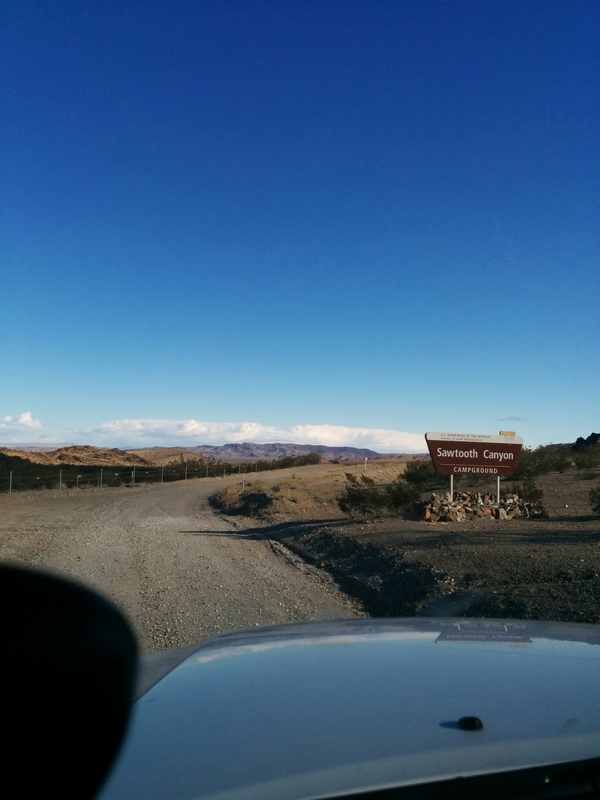 Continue further up the dirt road and you come to the top area with a second pit toilet and another half-dozen or so campsites. There are 13 sites in all. Each site has a fire pit with a grill, a bbq, sturdy shade ramada and a concrete picnic table with unmovable benches. No water or trash service is available so bring your own and take yours out please. There were two sites taken at the bottom and two at the very top so Willow and I picked one in the middle and had two campsites to ourselves. We couldn’t see anyone else and barely heard the small group of rock climbers closest to us, about 50 meters away. A bit windy as we get situated and start the stove for dinner. Relax and read a book as Miss Willow runs about getting the lay of the land. It’s been a long day and we both sleep like logs. We like this place. A bit barren but beautiful in its own way. The few times we have been here it has never been crowded at all. It is also Free which is a huge plus in our book. 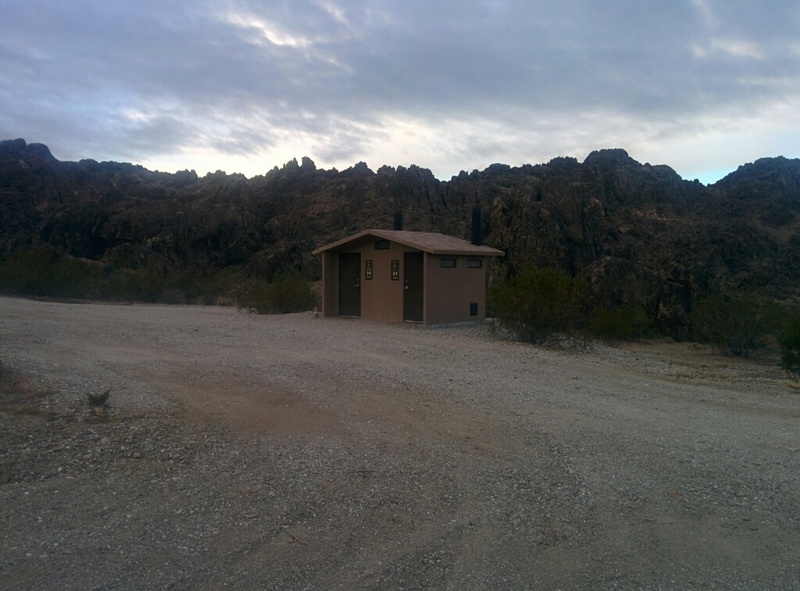 This is our standard, go-to place for a night or two when we are in the Barstow Area.